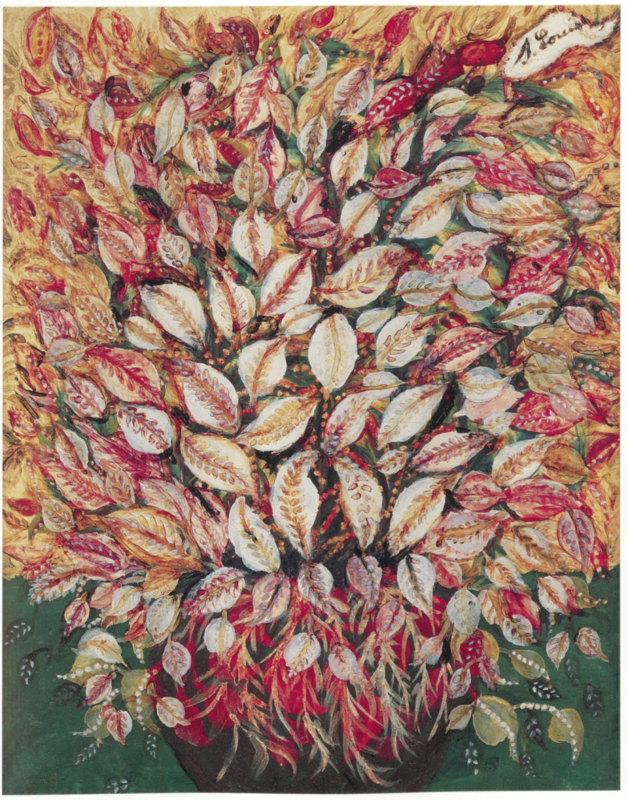 Seraphine Louis, “Feuilles,” (c. 1928), oil on canvas. Attempts to highlight non-canonical artworks and their makers tend to fall into common traps. Some fetishize the identities of the artists; others gloss over identity in favor of formalist readings. Many erase narratives of inequality that the artists had intended to address with their reparative work. Lynne Cooke’s exhibition Outliers and American Vanguard Art, remarkable for its breadth and depth, evades these pitfalls in its examination of difference. Cooke’s show presents an ambitious, complex web of works connected across aesthetic, temporal, geographic, cultural, and political lines. Through her curatorial choices informed by her practice of critical fabulations, Cooke proposes new areas of inquiry and inspires meaning-making in a field that has often felt foreclosed and inaccessible. “Exhibitions have the capacity to elicit an affective, bodily response that a scholarly text simply cannot produce.” Cooke, Senior Curator of Special Projects in Modern Art at the National Gallery, related this argument to me while we walked through the show, and this line of thinking is apparent in her work. The show operates with a cognizance that any viewer moving through space can and will construct their own connections and derive meaning from these works by trained and self-taught artists. The show’s subversive element stems in part from Cooke’s choice to bypass the outsider/insider binary in favor of a new critical framework altogether. Situating her work in the context of “new exhibition typologies identified as curatorial and critical fabulations,” Cooke “construct[s] narratives that resituate artworks on the basis of alignments—material, process-based, thematic, and so on.” These fabulations invite alternative, provocative, and radical interpretations. 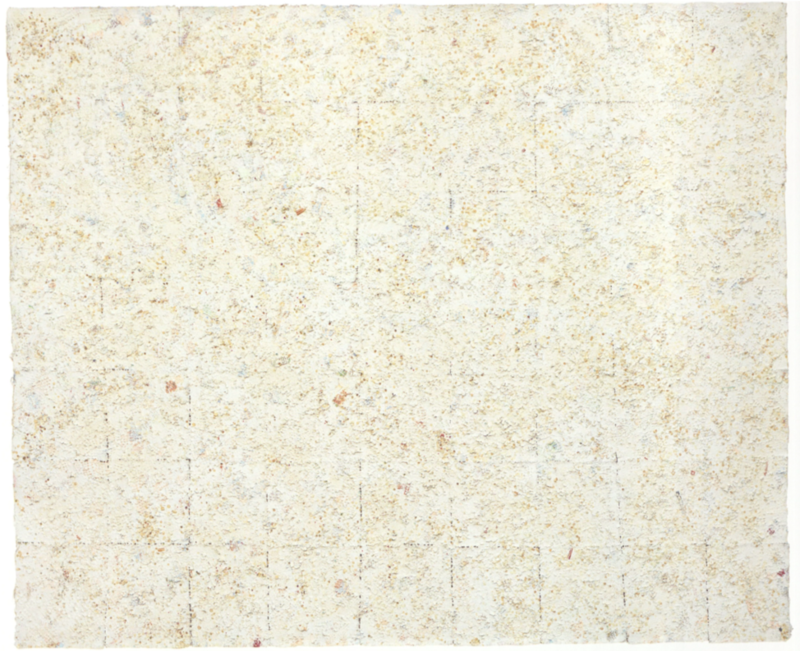 Howardena Pindell, “Untitled,” (1977), mixed media on canvas. Image courtesy of the artist and Garth Greenan Gallery, New York. 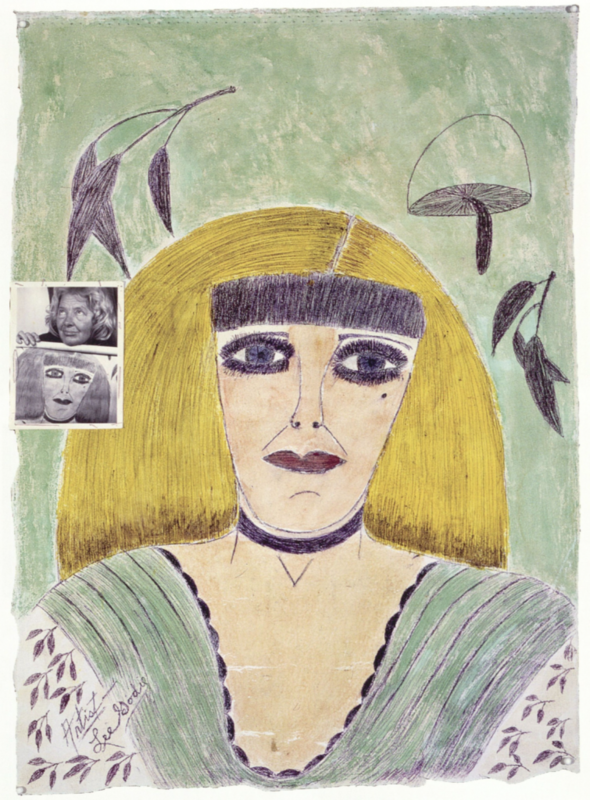 Outsider art contends with the same categorical ambiguity and vocabulary problems today that have beleaguered autodidacts’ works for decades. Inadequate, incomplete terms referring to an already unclear body of artworks pile up: folk, primitive, self-taught, visionary, naïve. The work, marked by nothing beyond its state of being “Other” to the equally-broad category of Fine Art, finds itself clouded with murky vocabulary. The baggage of these terms combined with the fraught history of exoticizing difference is enough to discourage an ethical scholar from exploring an under-examined field of makers. Cooke’s new term is exciting. It foregrounds artists’ agency. It offers a method for thinking through fringe artists and atypical works that is not contingent upon their wackiness or victimhood. It also highlights relationality: an outlier is always in relation to some established norm. The term is useful not only for its application to works traditionally classified as folk or self-taught art; it also opens new possibilities for placing these works in tandem with works outside the scope of outsider. Outlier art can and does include art by canonical, traditionally-trained artists. As autodidacts are folded into mainstream art institutions, this term allows for the complexities that inevitably emerge. For example, Henry Darger or Judith Scott are arguably more “inside” than some lesser known trained artists in terms of their works’ monetary value and museum representation. Inversely, art world favorites like Cindy Sherman and Kara Walker undergo new readings when considered through the outlier lens. Outliers premiered at the National Gallery, is currently showing at the High, and will soon travel to LACMA. I had the opportunity and pleasure to see the show in the former two iterations in D.C. and Atlanta, and the delight of speaking with curators Lynne Cooke and Katherine “Katie” Jentleson—who oversaw the hanging Cooke’s show at the High with some site-specific additions—in their respective spaces. The first emphasizes her new theoretical and critical framework for thinking through difference differently in modern and contemporary American art; the latter considers accessible narrative constructions of beginning-middle-end and especially pulls upon her institution’s strong holdings of southern black art in her interpretation. Both provide radical, new insights regarding how to position works by traditionally marginalized artists in the context of elite museum institutions with ethical, politically aware, and active stances. Cooke divides the exhibition to three moments in time during which self-taught artists and their work received critical attention from mainstream art institutions. Cooke’s temporal frames place the art within the context of early 20th-century folk aesthetics, mid-century “commensurables and incommensurables,” and a third wave of 21st-century efforts to think through difference in the wake of contemporary critical theory. 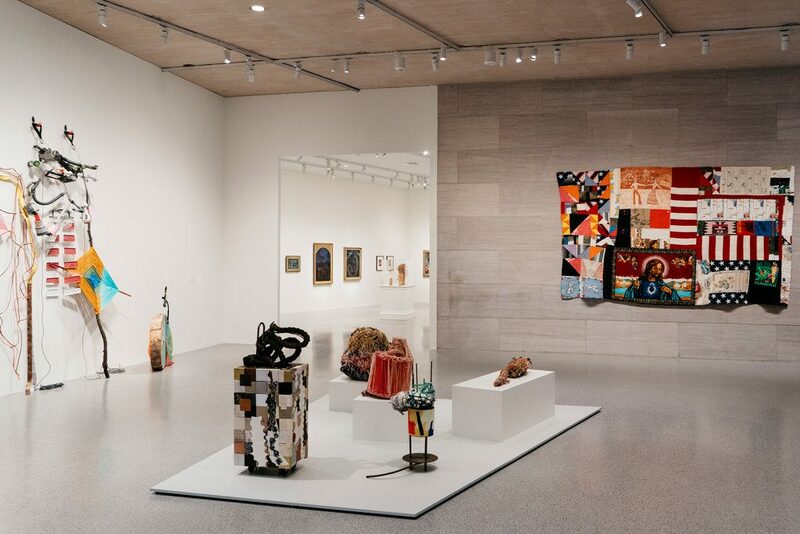 At the National Gallery, Cooke placed contemporary fiber works at the exhibition’s entrance in spite of her overarching temporal sequencing. Works by Rosie Lee Tompkins, Jessica Stockholder, Judith Scott, and Nancy Shaver greet the viewer. This first brush prefigures concerns that will remain salient throughout the entirety of the show: race, gender, class, disability, and craft. 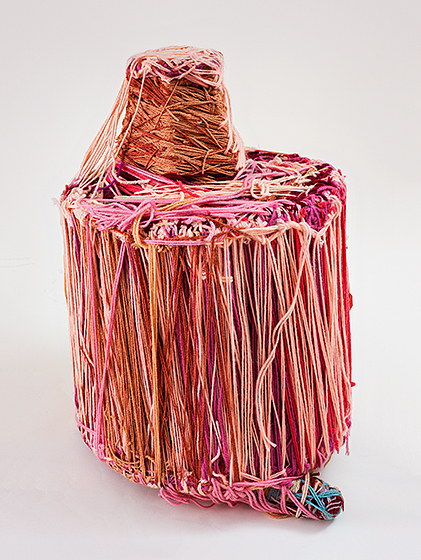 Judith Scott, “Untitled,” (2004), fiber and mixed media. Image courtesy of The Museum of Everything, London. Speaking with Cooke, she made clear her intention to place objects together that signal gendered women’s practices. The works’ processes and materials tie to domestic, communal work. This initial encounter, like the entirety of the show, places self-taught (Thompkins, Scott) and taught (Stockholder, Shaver) artists’ works in conversation with one another. The formal relationships between works by trained and untrained artists foster an implicit, intuitive recognition that the included works are wedded and webbed with one another despite the different levels of makers’ social status and access to resources. The works’ shared bright colors, found materials, and fiber establish an aesthetic relationship. Cooke’s choice is provocative in its dismantling of taxonomizing hierarchies while providing informative text that locates and explicates difference, all while remaining visually inviting. She works deliberately to provoke generalized audiences visiting the galleries; she generates questions regarding inclusion and diversity. Photo credit: Justin T. Gellerson for The New York Times. Cooke’s exhibition is not about tracing her subject from the past as it comes in to the present. Her curation establishes threads and crossings amongst objects and explores the shifting positioning of craft at the time rather than recounting a cause-and-effect history. Moving through an exhibition space is not a linear process, and rather requires webs of interconnection between objects and viewers. While moving through the curator’s constructed web, the viewer chooses and establishes her own web between works. This process is a testament to a type of visual thinking without a textual or verbal equivalent. The inclusion of trained artists like Florine Stettheimer within feet of self-taught artists like Séraphine Louis is layered and deliberate. Both Stettheimer and Louis share in the fullness of their represented forms; the works appear both inspired and inspiring. Their works are marked by their spiritual and ecstatic under and overtones, and demonstrate incredible freedom, ebullience, and joy. Both flow and vibrate with color. Examination of the works’ accompanying texts points towards equally compelling social and historical contexts of the artists’ lives as a wealthy saloniste and an isolate housecleaner respectively, both unmarried women living during same turn-of-the-century moment. This moment of connection between works of two artists who, in all likelihood, had no knowledge of one another, is one of many possible relationships a viewer might construct. 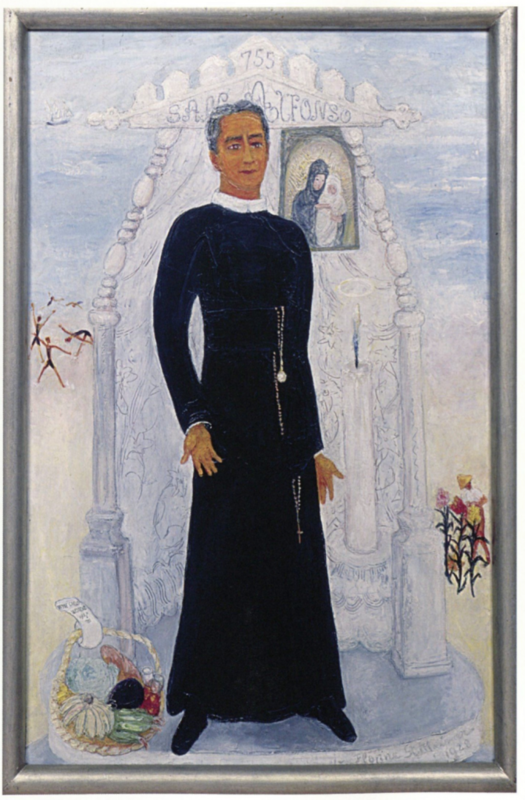 Florine Stettheimer, “Father Hoff,” (1928), oil on canvas, artist’s frame. Photo by Benjamin Blackwell for the University of California, Berkeley. Cooke emphasizes the importance of presenting works relationally without somehow establishing hierarchical modes of thinking. Putting Joseph Yoakum and Martin Ramirez next to the Chicago Imagists who benefitted from collecting and reworking their aesthetic choices, and then Henry Darger’s prolific tracings and textual work next to Matt Mullican’s hypnotized performance works, she conjures potential conversations, conversions, refractions, reflections, tensions, and divergences without inherently valuing one type of work over another. My experience of Outliers at the High differed more than I expected. I mentioned this upon meeting with Katie Jentleson, the High’s Merrie and Dan Boone Curator of Folk and Self-Taught Art. She noted that my initial, intuitive response to the difference could stem from the fact that the High’s space has less square footage and demands more in terms of accommodating the works. She also nodded towards the impact of the first visual encountered in the space: a salon style hanging of the early folk art which a viewer approaches coming off the elevator. This salon style grouping allows for diversity in artist and folk cultures. Though the first tableaux of Cooke’s and Jentleson’s shows both immediately mix academic and autodidact work, the first impression of a group of contemporary fiber sculptures inherently differs from a group of early 20th-century paintings. 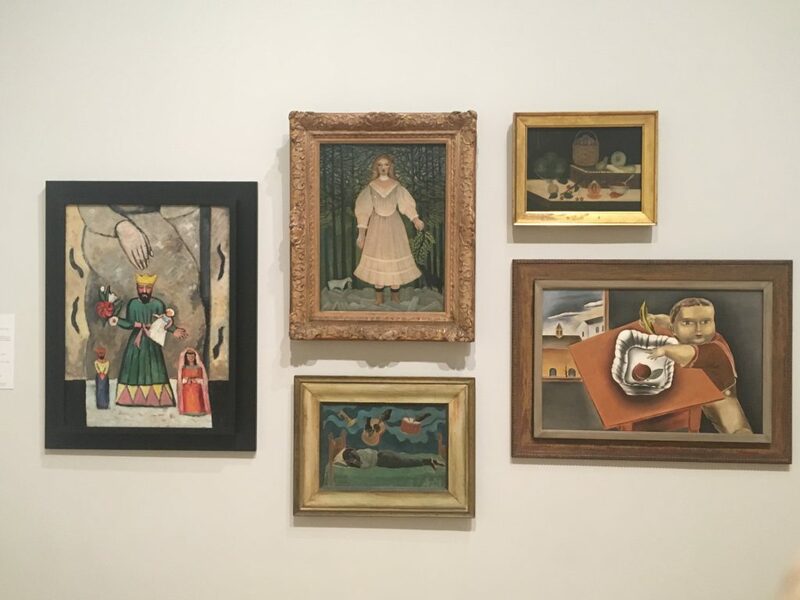 Salon-style hanging at the High, featuring the work of the following artists (clockwise, starting at left): Marsden Hartley, Henri Rousseau, Anonymous American (? ), Yasuo Kuniyoshi, Palmer Hayden. The High’s hanging of the show is more linear and categorical. Each room centers its specific place in the temporal framework as part of either the first, second, or third waves of confluence with mainstream and outlier works. Within those three categories, Jentleson further emphasizes the moments’ three distinct subcategories: first wave’s folk art fever, MoMA leadership, and configurations of primitivisms; second wave’s Chicago Imagist moment, California assemblages, and southern artists receiving recognition; and third wave’s photography and identity, reappraisals of textile and craft practices, and artists as world imaginers. Additionally, the High features much more contextualizing wall text to highlight these inclinations and their historical context. These narratives existed in Cooke’s configuration too, but Jentleson’s addition of larger text panels emphasizes them. Jentleson stresses that working with self-taught art is not just about making diversity apparent or legible, but humanizing artists. Her attention to artists as people is apparent in an interactive tool presented both in the gallery and on the High’s website, which allows the viewer to group works by women artists, artists of color, southern artists, and more. Jentleson discusses the difficulties of balancing impulses towards integration while curating from her own separate, differentiated department of Folk and Self-Taught Art. The benefit of delineating specific terms for self-taught art, according to Jentleson, is in increasing accessibility and heightening presence in public discourse. This point allows Jentleson to reference the importance of Cooke’s consideration of reception history. These points of reference show how autodidacts gained cultural capital in mainstream institutions. And yet, Jentleson cautions that some categorizations may not read as intuitive to all viewers. Henry Darger, Forrest Bess, and Lonnie Holley all fall under the world imaginer categorization in the High’s space, yet their practices are wildly different. Jentleson readily acknowledges that Cooke’s intention is to posit relationships between artists that did not always exist but could have. Jentleson’s own curatorial practice finds inclinations from her background in journalism: she seeks clear beginnings, middles, and ends to anchor people in their historical context. Jentleson mentions that Cooke’s show covers a lot of territory and is incredibly complex. She also mentions a potential missed opportunity related to her own collection and curatorial interests regarding art in the American South. The High’s permanent collection contributes some illuminating self-taught additions absent at the National Gallery, like a doll by Nellie Mae Roe and a painting by Minnie Evans. As it turns out, there are no trained artists in the gallery featuring Southern works. Jentleson spoke at length about University of Georgia Art students who worked as ambassadors for Nellie Mae Roe and Howard Finster. Recovering and reviving these avant-garde artists from UGA, in hindsight, could have bolstered the exhibition. In this, Jentleson identifies the generative nature of Cooke’s exhibition, which acts as a starting point. Cooke’s show prompts considerations of new ground to cover in future exhibitions. Outliers is not a hackneyed attempt to “center” works at the margins, nor does it presume to provide an all-encompassing, exhaustive account of American self-taught art. Instead, Cooke and Jentleson present viewers with alternative modes of viewing 20th-century encounters between fringe works and mainstream institutions. Julia Bryan-Wilson articulates this sentiment in her assessment of the show: “As ‘Outliers’ argues, this constant churning—this trespassing of the borders of high and low, this teetering between the unknown and the famous—is essential to the dynamism of American art itself.” In the nature of its included objects, the show foregoes condescension, closed-off didacticism, or authority-based hierarchy in its interpretations. The web-like relationship between the objects repeats itself in the curators’ extension of authority vested to the viewer, whose response to the churning, trespassing, teetering dynamism will bring about new methodologies beyond the purview of conventional scholarship. Lynne Cooke, comp., Outliers and American Vanguard Art (Chicago, IL: National Gallery of Art, University of Chicago Press, 2018), 20. 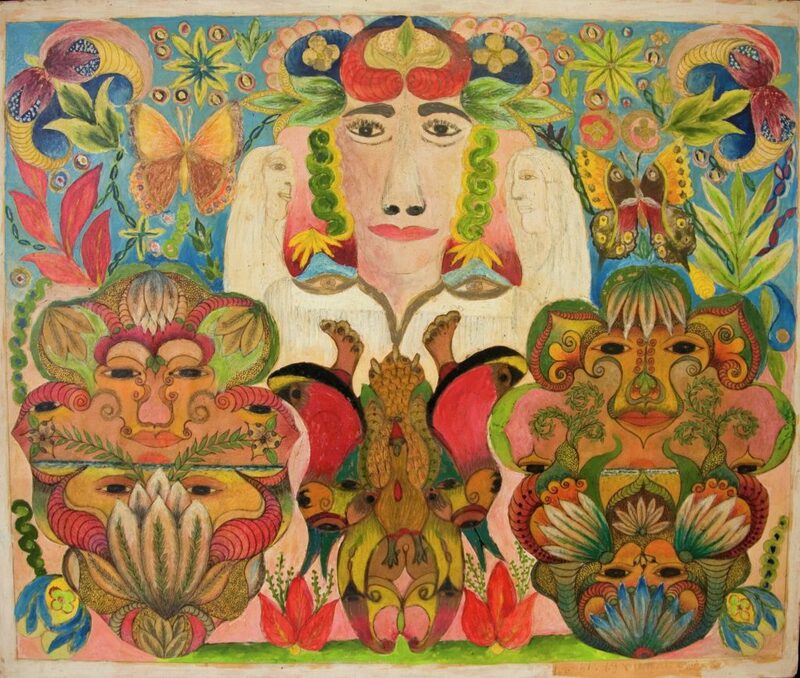 Julia Bryan-Wilson, “Review: Outliers and American Vanguard Art,” Artforum, May 2018, accessed July 26, 2018, https://www.artforum.com/print/reviews/201805/outliers-and-american-vanguard-art-75055.